Typical in the northern regions of France where excellent apples and cider are produced and mussels are found in abundance along the coastline. Start by scrubbing the mussels clean in cold fresh water. Remove any barnacles on the mussels and pull the beards off them. Place the cleaned mussels into a bowl covered with a cold wet cloth and keep to one side in the refrigerator until needed. Peel the apples and cut into ½-cm cubes. Keep to one side. 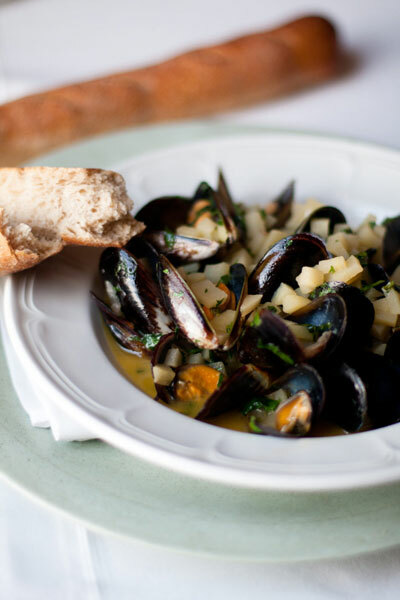 When you are ready to serve, heat a medium saucepan that will comfortably fit the mussels to smoking hot. Place the mussels into a dish and pour the cider over. As soon as the saucepan is hot enough, quickly place the mussels and cider into it and cover with a lid. While the butter is doing its magic with the sauce, roughly chop the parsley and scatter it into the saucepan, stirring to mix everything. Decant into 4 bowls and serve immediately with a crusty baguette rustically torn into pieces. Tip: To serve this dish as a main course, just double-up on all the ingredients.